Rubber solutions are used in a wide range of applications, including adhesives, sealants, paints, carpet backing compounds, tyre compounds, etc. In addition to natural rubber, synthetic rubbers such as Neoprene and butadiene are also used for these applications. The mixer is then started. Mixing continues for several hours until the rubber is fully solubilised. Finally, other ingredients such as pigments, fillers, stabilisers and lubricants are added and dispersed into the mix. Long mixing times are required to complete solubilisation. Solvent loss must be minimised. Synthetic rubbers such as Neoprene are extremely tough and require a certain degree of shear to disintegrate and solubilise them. Centrifugal force drives the materials to the periphery of the workhead, where the rubber is subjected to a milling action in the precision gap between the rotor and stator. The product is forced out through the stator as fresh materials are drawn into the workhead. In a short mixing cycle the entire contents of the vessel passes through the workhead and solubilisation is rapidly completed. Each of the options illustrated is preferably installed in a closed vessel, jacketed to prevent excessive temperature rise. The lid is cooled separately, causing solvent vapour to be condensed and returned to the mix. By this method there is a negligible loss of solvent without the additional expense of sealing the vessel and mixer shaft. Particle size is progressively reduced, exposing an increasing surface area to the solvent, accelerating the solubilisation process. 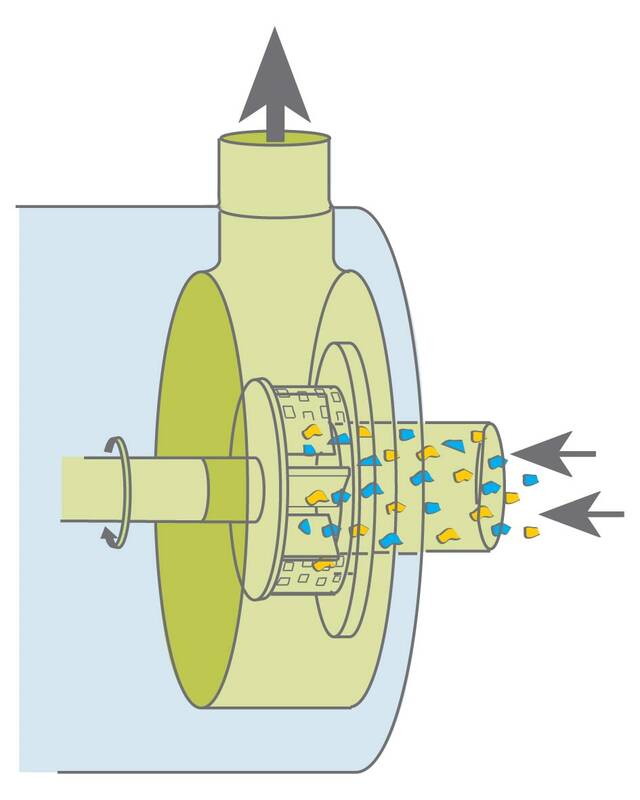 The lower workhead then draws the liquid and solids upwards from the base of the vessel and further reduces the particle size, accelerating the solubilisation process. Shredding or granulating of rubber to a fine particle size is not required. Coarsely chopped material can be added to the vessel and finely disintegrated and solubilised by the Duplex mixer. This greatly reduces overall processing time. Vigorous in-tank agitation ensures particles do not reagglomerate. The combination of vigorous mixing and particle size reduction accelerates the solubilisation process.